Bronwyn Darrow laid the map flat on the large stone. His calloused finger traced the road from Wirksworth to Little Ram, stopping midway between the towns. In his mind, he thought of the distance from this point to his current location on Blue Mountain. If he continued south west, he’d intercept the trail to Glengarry Keep. Considering the rough terrain ahead, he estimated it would take five days. He’d know he was on the right path when he reached River Blue. He glanced up at the sky. Clouds were moving in. He had to cover as much ground as possible before dark. Although it had been risky to travel this far into uninhabited land, the venture paid off. He had found the hamlet of Drumclog Moss and met the prisoner who had been held at Blackvale for three years. The woman was released shortly after Isla had arrived, and she provided enough information to give Bronwyn hope. Isla was alive and unharmed. The woman had said the other prisoners gave her special care, but the terrified child wanted only the comforts of home. Bronwyn folded the map and slipped it into his belt pouch. He fastened the bridle onto Sorrowsweet’s head and mounted. For once, he wished he was horse, or at least had the ability to graze. Sorrowsweet had plenty to eat at this low altitude, but the season and terrain provided little for a dwarf. He took a mental inventory of the food he carried. If he had one small meal each day, he’d have enough to reach the keep. Two days later, Bronwyn stumbled from the saddle and towards red berries glistened in the sunshine. He fell to his knees and picked the strawberries feverishly, shoving them into his mouth. He had never tasted berries as sweet. 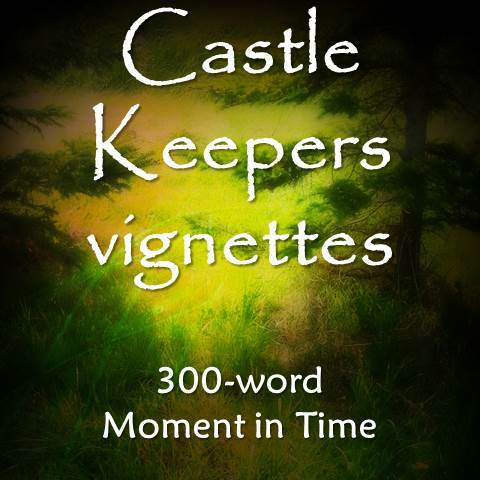 The Castle Keeper vignettes provide a glimpse into the time betweenShadows in the Stone and Scattered Stones. You’ll have already met many of the characters, but some you will meet inScattered Stones.